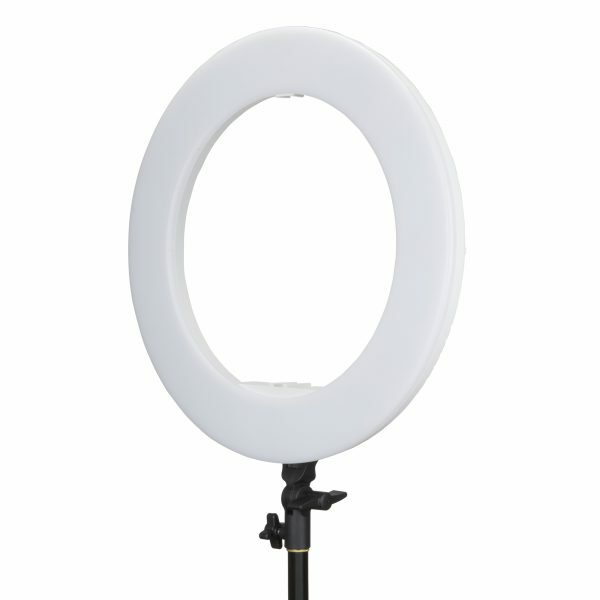 The Interfit 46cm (18”) LED Ring Light is a daylight balanced LED light that is perfect for both photography and videography. Stylish controls allow for flicker-free adjustment for dimming the light. The circular shape of the LED lights evenly illuminates the subject, making this light perfect for vlogging, portraits and more. The diffusion filter provides a soft light output giving a gentle wrapping light to softly illuminate your subject. The backlit digital LCD display clearly shows the brightness output. Power can be provided by the included 15V DC lead or by using two Sony NP type batteries (Sold Separately). inner divider and padded walls. This allows your equipment to be stored safely and easily transported from set to set. Includes: (1x) LM8 BI 48W Ringlight, (1x) Mirror, (1x) Mobile Phone Holder, (1x) AC Power Cord (Batteries not included), (1x) Carrying Case.